Priya challenged the Home Bakers Challenge members to bake crackers. As usual the first few days are spent on deciding which recipe to follow, this one, no that one, try them all! Usually don’t have time to try them all but the recipes keep on piling up in the bookmarked section. I finally decided on the poppy seeds and sesame seeds crackers. After baking them, I was wondering why I have never tried baking crackers before. They are healthier than the normal cookies and loved them. I use to love the dinner crackers made by House of Manji when I was a kid. These days the dinner crackers have no taste and I have stopped buying them. I baked them two days ago and already they are nearly over. Will have to bake some more. Here’s the recipe and they are very easy to make. You can use them as canapes for your party. Place small cubes of cheese, olives, a dollop of flavoured cream cheese, salsa. Anything actually. Or just eats on its own. Add poppy seeds, sesame seeds and pepper powder and mix. Either cut the butter into smaller pieces or just grate it and add to the flour mixture. Using your finger tips, rub in the butter into the flour till it resembles breadcrumbs. Add the water and form a dough. Do not knead the dough too much. Divide the dough into 2 parts. Wrap a cling film around one part and put it in the fridge till required. Grease a baking tray lightly with butter. Roll one part of the dough about 1-2 mm thick. Using a cookie cutter cut out the shapes. Place them on the baking tray and prick the shapes all over with a fork. Repeat the procedure with the remaining dough. Use up also the leftover dough by rolling it again and cutting into the required shape. Place the trays in the fridge for 20 minutes to chill the cut out shapes. Place the trays in the hot oven and bake for 20-25 minutes. After 20 minutes, keep an eye on the crackers. You don’t want them to get too brown. They are done when the edges are brown or the top becomes light brown. Remove the crackers from the tray and let them cool on the wire rack. 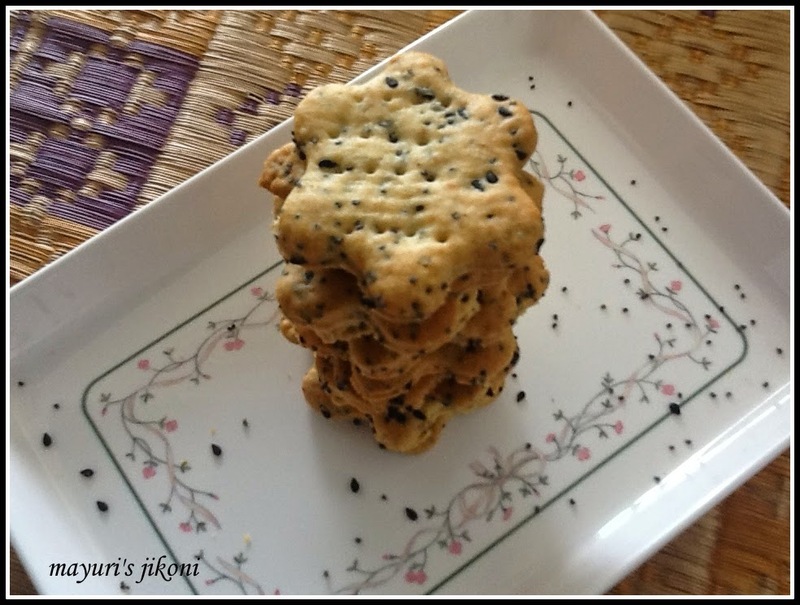 I used black poppy seeds and black sesame seeds. You can use any available. Cut into shapes you desire, small or medium. Don’t over bake as they will taste a bit bitter. As the original recipe suggested to use baking paper to roll the dough. I rolled it without the papers without any problem. Lightly grease the rolling board or work top. Grating the cold measured butter works great. Got the idea from Chef Micheal Smith. Roll the dough out thin (1-2 mm) as they will puff up on baking. The cookies look so beautiful, neatly done..